I asked my husband what his favorite vegetable was once. He thought for a long time and said, “Peas, corn, and maybe carrots.” This is the man that has NEVER eaten a dish that he thought had too many onions, and believe me I have tried. I would guess that most of us forget that onions are even a vegetable, and yet, many of us eat more onions in a year than about any other vegetable. Onions add to the rainbow of color I mentioned last week. High in vitamin C, fiber, and several phytochemicals, onions are nutritionally beneficial beyond the flavor they add to your food. I know onions can be strong, but caramelizing onions takes away the strong onion flavor and enhances the natural sweetness. 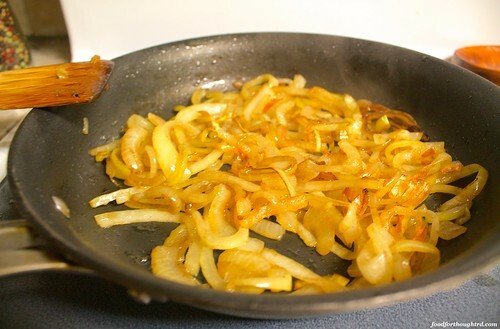 Caramelized onions are great on sandwiches, burgers, and hot dogs as well as in chili and some pasta dishes. This french onion soup is the perfect soup for a multi-course holiday dinner – full of flavor but very light. You could serve this with a more traditional cheesy toast on top, but I prefer a grilled cheese. 1. In large pot, melt butter over medium-high heat. Add onions; sauté until beginning to lightly brown. Add salt. Continue cooking, stirring occasionally until they are a deep golden brown, about 30 minutes. 2. When onions are sufficiently caramelized, add garlic powder. Sauté for about a minute, until fragrant. 2. Add broths, water, Worcestershire sauce, thyme, and bay leaf. Scrap bottom of pot when adding broths to get any brown bits off the bottom. Bring to a boil. Reduce heat, and simmer uncovered for 20 minutes. Reduce heat to low and stir in vinegar. Serve warm. Remove bay leaf before serving. Recipe Notes: I’m including a process shot for those who haven’t caramelized onions before. This took at least 20 minutes, and I’d keep going. Caramelizing onions takes patience. Take deep breaths, and give them time. It kind of looks like a watery mess at some points. That is just the water coming out of the onions, which is good. I know this seems like a lot of onions. But they are kind of like leafy greens – they shrink a lot when cooked. I would be fibbing if I said this was my favorite soup ever. It was very tasty. I’m just more of a soup-as-a-meal rather than soup-as-a-course person. 1. Combine cream cheese and shredded cheese. Divide evenly between 4 bread slices. Top with remaining bread for sandwiches. 2. Heat a skillet to medium to medium-high heat. Place ¼ teaspoon of olive oil on skillet and place 1 sandwich on top, swirling sandwich a bit to coat with oil. Repeat for remaining sandwiches. When browned, flip sandwich, putting another ¼ teaspoon of olive oil under each sandwich mid-flip. Brown second side. Recipe Notes: You could use whatever shredded cheese you prefer. 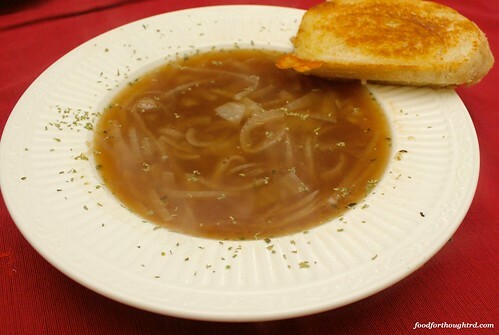 Swiss cheese and french onion soup are a classic combo. These are a little more intense than traditional grilled cheese, I know. But they are very good and cut quite a bit of fat.